Smashbox Cosmetics owes its origins to Smashbox Studios, a film and photo studio in Los Angeles. This studio, and makeup line, were founded by two great-grandsons of the Max Factor, cosmetics pioneer and inventor of lip gloss, among other things. Smashbox Cosmetics were originally made for photo shoots and films; they are therefore consistently high quality. High quality means high price, but their cosmetics aren't prohibitively expensive; most Smashbox products run in the $20-50 range. When I first learned that animal testing was a common practice in the cosmetics industry, I was disgusted. I simply could not believe it. From that day forward, I told my staff that all our products needed to be cruelty-free and to only work with manufacturers that do not test on animals. I was extremely excited when that day came six months later, and I am proud to be selling products that are completely cruelty-free. 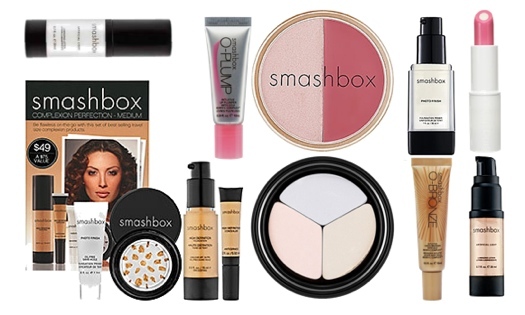 Smashbox has also donated to the Haiti Relief Effort, the Children's Miracle Foundation and Covenant House California, a shelter for homeless youth. Smashbox's products run the gamut of cosmetics offerings, from makeup primer to blush to lipstick to eyeshadow. No nail polish, though. Like most makeup brands, Smashbox's eyeshadows and lipsticks get higher marks than their foundations and primers, which vary in their effectiveness much more than lipsticks and eyeshadows. So, what's the verdict? Will Smashbox Cosmetics make you look like a movie star? If you look like a movie star, the answer is "yes." But even if you don't, they are high quality, cruelty-free and are used by many professional makeup artists. Despite mixed reviews, Smashbox has a high reputation, both ethically and quality-wise. Above collage made via Polyvore.